Have you ever visited a website and been completely overwhelmed with the amount of information, ads, links, and CLUTTER? Have also you ever visited a website and been impressed by the graphics and the ease with which you could find information? This post is going to offer some tips for organizing and effectively communicating value through your studio website. Last week, I came across a very interesting article about how your business cards are a representation of your business. The article features a number of examples of memorable and creative business cards, including the “piano repair” business cards pictured on the right. Click here to read the article for yourself: 15+ Business Cards Visualizing the Business. How can I make my business cards (and other studio handouts/materials) more memorable? How do my studio business cards and other materials represent my business? What image are they giving to my parents and students? Check out this series of 4 videos about Roland’s V-Piano. They claim: “This is the future of the piano.” Thoughts? 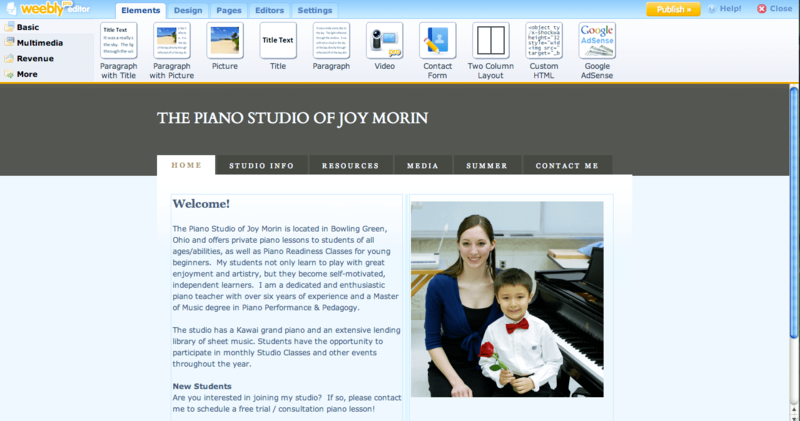 Advertise for new piano students by filling in this free Piano Lessons Flyer Template! Just edit and print in Microsoft Word (.doc) and you’ll be ready to post your flyers all over town. 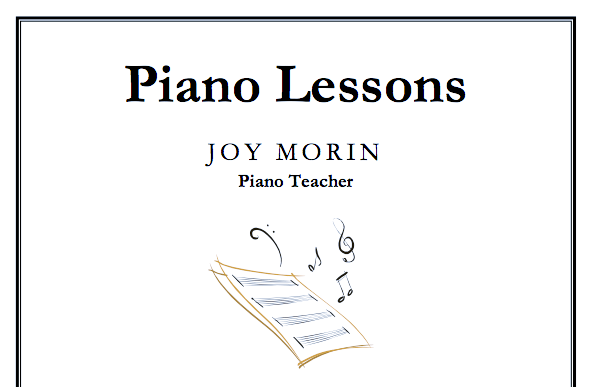 Download the Piano Lessons Flyer Template from the Printables > Studio Business page. Open the file in Microsoft Word and edit the file so that your own information is entered. Print the file. Using a pair of scissors, cut vertical lines from the bottom of the page (as marked) so that interested students/parents can rip off a tab with your name and contact information. You are ready to post your flyers all over town! Teach only when you want to. Don’t overdo it. Only schedule yourself what you can easily handle each day/week. If needed, schedule yourself an occasional 15-minute break so you can chill out for a bit and perhaps get a bite to eat. Teach only who you want to. Whenever possible, accept only the students who are motivated and hardworking. I’d like to also add: only teach the levels/ages you are comfortable with. For example, if teaching adult students isn’t your forte, don’t feel as if you have to accept them into your studio. Recognize the areas where you shine and make those your focus! Same goes with styles of music: if you aren’t comfortable teaching jazz, recommend those students to another teacher who is comfortable doing so. Keep it fun and fresh by varying up each lesson, and tailoring lessons to each individual student. Be on the lookout for new music books or games to try with students. Try to discover each student’s interests, strengths, and weaknesses so you can personalize their lessons to their individual needs. Attend local/state/national music teaching conferences so you can continue your own education as well as network and exchange ideas with other teachers. Find ways to make sure your students are making progress. When students are making progress, students are having fun, and when students are having fun, the teacher is having fun! Decorate your studio, create an incentive program, keep communication open with parents to keep them involved, have a practice requirement — in short, find ways to keep students engaged and motivated to develop their skills at the piano and excited about lessons! All these ideas above are part of being an effective, successful teacher — and that’s when teaching becomes a vacation rather than a vocation. Great thoughts, everyone! Stay tuned for the introduction of the July Forum topic, coming later this week! My husband and I recently rescued a cat (pictured at right)! We spent a lot of time thinking up a name for her. I wanted to give her a music related name, but as it turned out, we ended up agreeing to name her “Kira.” But for any of you who might wish to give your pet a musical name, I’ve compiled a long list of my favorites! When you get a phone call from an parent of a potential student asking about studio information, should you inform potential students of your rates first, or should you tell them about your studio first? I know a fellow teacher who does not answer the “rates question” – even when specially asked about it – until the end of the phone call, after she has told them about everything her studio offers. She chooses to emphasize the quality of the music education she offers in her studio before informing the parent of the rates. Not a bad idea! Other teachers are very upfront and prefer to tell parents their rates first thing. There is no harm in either method. Personally, I am somewhere in the middle. Unless specifically asked, I save the rates information until the end. Regardless of where you stand, it’s a good idea to plan in advance how you are going to deal with the “rates question” when the potential student calls. How do you like to handle the “rates question”? Here’s a list of 30 theme ideas for music studio events! Themes can be used as the studio theme for the school year, or for summer music camps, or for studio recitals. If used for the studio theme for the whole year, there are a number of ways the theme can be incorporated: the incentive program, group lesson activities, worksheets, games, food, decorations, dress, recital repertoire, etc., can all be coordinated to fit the theme. Fantasy | same as above, plus dragons, wizards, etc. Art | colors, brushes, make connections between art and music. Activity: compose songs named after colors. Roller coster park | use this theme to study musical forms (e.g., ABA), or musical styles. Animal Planet | animals galore! Activity: try matching animal characteristics to how different music sounds. Splish Splash | water bottles, droplets, river, brook, ocean, puddle, rain, hydration, summer, squirt guns, pool. Listen to Debussy’s La Mer. Outer Space | stars, moon, sun, rocket ships, astronauts, aliens, ufo’s. Natalie is doing a space theme in her studio this year and it looks fabulous! Race cars | finish line, car, tires, gasoline, checkered flag, trophy. Activity: do timed worksheets for naming note on the staff. USA / Patriotic / Stars & Stripes | USA history, fireworks, wear red, white, and blue, or wear stars/stripes! Activity: learn about American composers. The magic of music | magician, magic tricks, deck of cards, top hat, magic wand, rabbit, gloves. Activity: discuss how music has the power to affect your emotions, change your mood, influence you to do something, etc. Blast from the Past | choose an era of music history: Classical, Romantic, Baroque, etc. Dress old-fashioned, eat popular treats from back then, etc. The Great Composers | choose a specific set of composers, and focus on one each day/week/month. Musical Instruments | learn about the parts of the piano, or the instruments of the orchestra. Discuss timbre, register, range, tuning, etc. Please share any additional ideas you have, or any resources you’ve found to be helpful for planning a themed event for your music studio! These resources are useful for conducting student interviews at the first lesson with a new or transfer student. The interview forms help evaluate the student’s musical aptitude and background, to help the teacher determine what level repertoire the student should be playing, as well as what technique exercises should be assigned. The student information form is designed to gather basic contact information from the student — as well as some information from the parent regarding the child’s personality/learning style and musical background. Read on….